What follows is the archetypal storyline of the Shaman of Light’s quest on behalf of his people. It is rich in mythic motifs and symbolic representations of Inner Truth and Wisdom. The value of a Mythic Story is that it speaks to All Peoples equally. There is a need to shift and change the storyline to accommodate each and every individual only insofar as there is an intended and direct activation or Initiation about to occur for the person who has requested that this Journey be done on their behalf. You will see, below, where this interlude of personal significance is denoted in red. The Old Shaman knelt next to his fire, packing a colorfully woven bag with icons, figurines, talismans, bits of feather, stone and bone. Each item bore significance, each carrying a prayerful intent of the People who stood or sat, laughing and talking respectfully, gathered outside his lodge. As he carefully acknowledged each item, greeting it as one would a person met upon the trail to the spring, with happiness at the meeting, he placed the ceremonial piece inside the bag where it would best find comfort and a sense of place. Stepping out of the lodge he saw that the Moon was about to rise above the red cliffs before him. Taking a few steps forward he turned to look back at his lodge, his home of many, many years. A strong framework of mastodon ribs and tree limbs lashed with rawhide straps supported a heavy covering of animal hides, layered tufts of grass and sun hardened clay. A set of ivory mastodon tusks framed the doorway. Smoke from the remaining fire drifted lazily out the top of the lodge’s smoke hole. Inside, he knew, from long years of having lived there, the inner walls were covered with a fine selection of tapestries made from various furs cut, fitted and sewn together precisely to create panels of geometric patterns. The floor was laid with layers of felted wool appliqué carrying the design of three concentric rings, each representing one of the Worlds of Creation: in the center the Earth where life is lived; in the middle section the Underworld – the place of Dreams. The outermost ring going up to the outer circular wall of the lodge held configurations of star patterns of the night sky, the home of the Old Ones who created the structure of the Dream that was then cast, like a shadow of light, into the World as the situations and substance of the lives of the People. The details of design upon the floor covering were in actuality a map of the way to journey from Earth, through the Underworld and into the Celestial. He knew these pathways by heart. His Grandfather, who was his predecessor and mentor in the passage of this body of Knowledge into his caretakership, had shown him the meaning of each symbol as a part of the overall whole. Carried in the patterns was a story to which he, the Old Shaman, was to activate and contribute to this night. So it was, as it had always been. Each Caretaker of the Ways must not only learn, and earn, passage along these sacred pathways shown, but must also explore the Other Realms and bring back a deeper understanding and blessing to the People and to the body of Knowledge. So had the Grandfathers and Grandmothers done before him, so would he do tonight. He gently blows a breath of life to the lodge and map, honoring his home, his ancestors and the challenges and dedication they had given in their life that he might be able to respond to this call of his People who, even now, were awaiting his journey into the stars to bring the blessing of the Old Ones into the Dream, and thence to the World, that their lives might be bettered thereby. He turns to the gathering of the People, raises his fingertips to his lips and again blows the breath of life, this time to the People, in honor of their presence. The People accompany him to the Great Tree that stands in the center of the village. It is tall, seeming to reach into the deepening dusk of the sky itself, its roots, gnarly and reaching, thrusting deep into the dark ground beneath. The Old Shaman places a felted wool pad upon the ground as a seat, something to add a bit of comfort for his old bones during the long night ahead of him. Shifting the colorful bag to his side, its strap looped around his neck, he sets his drum leaning against the trunk of the tree. He glances up to see the seven ribbons tied about the tree’s massive trunk. Seven colors, one for each bridge of the rainbow, extend one above the other, each separated by the height of a woman, as if they were seven Grandmothers’ headbands above him. He feels a deep ease, knowing that the Grandmothers are watching over him. The Old Shaman sits upon the pad and leans his back into the spine, the trunk of great girth, of the Tree. Picking up the Drum, he brings his bundle of raven feathers to the hand that grasps the handle of the Drum, his drumstick held in the other. He can smell the sweet smell of the incense that his People are burning to insure that the ceremonial grounds are sanctified. Carefully watching the horizon he follows the lifting glow of the Moon that is stealthily slipping up from behind the cliffs, soon to jump up into view and take its place in the indigo dusk. With the first glimmer of the Moon’s brightness the Old Shaman strikes the Drum with one strong resounding beat. The single beat pierces through the surrounding forest and echoes off the walls of the cliffs. He gauges the return of the drumbeat’s echo and strikes the Drum once again, fully synchronized between new beat and echo. Another echo ricochets, returns and is picked up, to be sent out again. Now, in between the echoes, the old Shaman taps his Drum to create a rhythm between the established echo-beats. In this way the old Shaman orchestrates the relationships of the surrounding environs and the sounds of the Drum, weaving the harmony of Nature. The resonant singing of the Drum replaces all thought, a deep and profound silence ensues. A drop of the head, the beat still steady and sure, the Old Shaman’s body relaxes. Only the Tree holds his body upright. Soon the hands holding Drum and drumstick drop to his side, the bundle of silver feathers caught, intentionally, between his fingers. Even as the Drum drops to the ground at his side the beat pattern and rhythm, echoing and re-echoing, seems to come from a ghostly musician afoot in the forest. Consciousness has subsumed itself into Awareness, the faculty of perception of the Spirit. The residual drumbeats resounding from the cliff face lifts the old Shaman’s Spirit. He is free! He looks at his feet, scans up his legs, gazing upon his outstretched arms, his body. It is vibrant, seeming to be made of a shining mass of spider webs that pulsates with light. 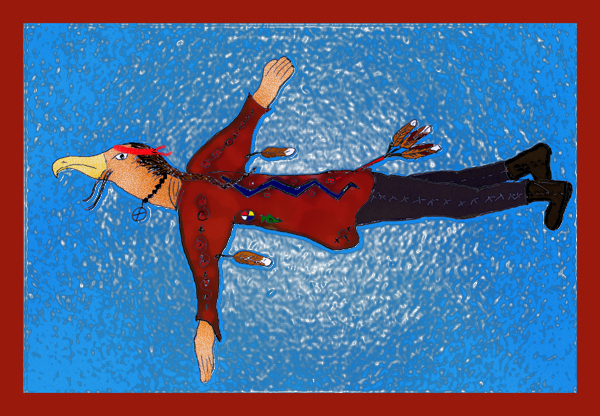 The Shaman of Light brings his gaze around to look at his physical body, lying below his vantage point. Smiling, he blows a gentle breath, which streams forth as a scintillating light, upon the recumbent form, appreciating his home that he has inhabited for many, many years. Looking further afield he sees a cluster of glowing ovoid orbs… the Spirits of his People gathered. The Shaman of Light breathes a stream of light upon them, joyous in their presence. Turning his gaze to the Moon, he drinks in the shimmering light of the Sky Orb. As he holds his attention upon the Moon he feels lighter, lifted. Threads of light, like the silk of a cocoon, shoot from his light body towards the light of the Moon. As the filaments of his Spirit body merge with the pulsing light emanating from the Moon, and are absorbed into the orb above, his threads are drawn in to that body, pulling, lifting him upwards. He is moving through what feels like a dark ribbed tunnel. There is the sensation of a thrumming, deep and intense, within the passageway. The Shaman of Light is flying, soaring ever upwards now. The more his attention is focused, the more do his threads spiral up to unite with the Moon, the faster is his flight. Soon he is rushing through the Darkness. He sees all about him the scenarios and memories of his own life. He knows that this is not important, unless the ghosts of his life are still charged with feelings, tuggings, yearnings. But he has moved through this terrain many times before. His Grandfathers and Grandmothers had given him guidance as to how to release his Spirit from these demons and fantasies by merging with each one and embracing it – his own guilts and shames and sorrows and unrequited loves – until it dissolved into light. Such ghosts no longer distract him, they are no longer alive. Instead he can now utilize his journey through the Realm of Ghosts to find and identify the ghosts of pain and suffering that still bind the Souls of his People to their own defeat. These collected sufferings become affixed to each respective icon and figurine of the People. Their Hopes and Desires now have Shadows. He is aware that he is now in the Red Region, passing through the portion of the Tree that is bound with the ribbon of that color. He perceives the obstructions of fear and greed, of not caring and selfishness that tether the emotions of his People. The Light Shaman widens his spiraling path upwards to encompass the ghosts of his People, holding each in compassionate embrace. Traveling free, as pure Spirit, judgment and revulsion do not exist, nor do adoration and glamor. All that is, Is. And what Is is either of the nature of harmony and balance or it is not, and if not, compassion impels him into the ecstatic embrace of realignment of that non-existence into Essence. As his Spirit soars ever upwards the Shaman of Light passes through each of the Ghostly Realms; Red followed by Orange, Yellow, Green, Blue Indigo, Purple – the seven bridges of the rainbow. Each has its own nature of ghosts and demons. Each is acknowledged as being the residing place of the Souls of the People, his kindred, his kind. Each is embraced, and placed, as the Shadow of the Dream. Up the Tree his Spirit flows, passing through the ring of each of the colored ribbons tied in place upon the trunk of the Tree. Though the drumbeats have long since ceased, they have set his Soul to pulsing with their rhythm. This rhythm keeps his frequency of vibration in accord with the innate thrumming of the ribbed passageway he is ascending within the Underworld Realm. At long last he has traversed the Ghostly Realms. The Shaman of Light now finds himself in the region that shines with a luminous purple haze. Knowing the cues given him by those who have gone before, he moves his Spirit body into a fully upright position. The threads of emanation now coil out the top of his head and anchor him to the Moon. A pillar of condensed threads extrude from the base of his spine and out the soles of his feet, wending their way down, as the roots of the Great Tree, rooted to the Earth. In his upright position, he experiences the familiar feeling of a buzzing from the dynamic tension created by his column of threads that are the connector between the polarized forces of Moon and Earth. The Power surges through him. He pivots, turning to his right, until he feels a tug, a pull. Continuing beyond the place of the tug, he revolves another 360 degrees, returning to the position of the tugging pull. He holds himself there, the dynamic charge now coursing through him like a bolt of lightning. The Shaman of Light knows, from training and experience that as long as he can maintain the upright position the Power will continue to build within him. Having returned to the place of the pull, he gives in to it, slightly, then pulls back, resisting. The tug is now stronger, drawing him forward, pulling upon the Star-Within that resides at the place of his solar plexus. Once again, willfully, he releases into the pull, then, with great effort, resists, letting the power build within him through this exercise of release and resist. Finally, one last time, he holds, holds, holds, and then… he surrenders his resistance and allows himself to be drawn, forcefully, out of the tunnel of darkness and into the brilliant purple haze. There is a loud POW! as he transits from the Underworld Realm into the Celestial Realm. The purple light is effervescent, fizzy, slightly tickling. The Shaman of Light moves into the mist, the colorful bag containing the desires of his People still slung about his neck. He makes his way by feel, the sense of the correct way to move like a fullness, an incorrect movement feeling hollow. Through this felt-sense perception he proceeds. As he continues to move the mist peels away. He finds himself in a glade within a deep forest. Tall mountain peaks surround him. Diagonally to his right and ahead of him he sees the glow of a fire just inside the edge of the trees. The Shaman of Light moves towards Grandfather Fire. As he gets closer he can make out forms, figures of Light, but similar to shadows. Light Shadows. He knows these to be the Elders, the Dream Makers. These are the Ones he has come to be received by. As he approaches Grandfather Fire he lowers his gaze to look into the coals that comprise the base of the fire. Kneeling before Grandfather Fire, the Shaman of Light asks permission of Grandfather to cleanse and bless himself with the coals of the fire. When permission is asked, permission is granted. The Shaman of Light reaches his hands of shimmering light into the coals and withdraws a double handful. Placing his hands at the top of his own head, he draws the coals down across his body, bringing his Celestial Soul into resonant harmony with Grandfather Fire and the Council of Elders who awaits his attention across the fire from him. Two more hand-scoops of coals follow, one each for alignment of the Shaman of Light’s Earth Soul and his Underworld Soul. There is neither pretense of hierarchy nor expectation of fear. The Elders are harmony and balance expressed; they are Principles of Life, the Makers of Dreams. The Elders await the offerings the Shaman of Light has brought them. He opens the bag and lays out before Grandfather Fire the icons, figurines and talismans that embody the prayerful Dreams of his People. Each one the Shaman of Light lovingly picks up and respectfully announces the nature of the Dream of each person who had placed this trust into his care. In this position within the unfolding storyline will be written your specific request and the corresponding Gift of Empowerment that has been given you. It will be unique to you and will have relevant guidance as to how to best integrate the gift into your life. With each Dream presented the Shaman of Light brings forth an icon or figurine, a carved bit of bone, shaped stone, a tuft of feathers, each in its own symbolic form a representation of the intimate desire of someone who had asked him to carry their Dreams to be included in a greater Dreaming of the World. And with each, its Shadow is revealed. The forms of the Elders across the fire shift and disassemble, then reassemble to become the specific expressions of character and essence required for the insemination and manifestation of the Dream of each request. The Dream Makers seem to float in patterns about each other. The floating takes on pattern and the forms take on distinction. The Dance has begun. Old Woman Bear (Earth) shuffles around the Fire (Sun) in a counter-clockwise direction. Raven (Moon), brilliant silver of feather, flies about Bear, round and round. Hummingbird (Mercury), whose green-feathered body sports a shiny ruby-red throat, darts around the Fire, seeking blossoms upon which to alight. The Red Stallion (Mars), proud and powerful, kicks up his heels and tosses his mane in a show of earnest desire to run, to set forth to action. Beautiful Maiden, (Venus), is swirling and twirling around to the far side of the Fire. Eagle (Jupiter), flying aloft, circles upon the air’s draught, taking it all in. Shape-Shifter (Uranus) lurks, ready to lurch into presence without warning. White Stag (Neptune), a wound in his side, is standing just outside the light of the Fire. Far, far across the Fire, deep in the Darkness, Black Wolf (Pluto), Eater of Memories, watches… and waits. All the while the She-Lion (Saturn) shelters her cubs in safety within her den. These Elders dance and initiate form within the Dream-of-Us-All. The Old Shaman, having presented the Dreams of his People to Grandfather Fire, nudges them into action. Eagle, Hummingbird, Red Stallion and Shape-Shifter coalesce, lending each their own quality of character to the task disseminated them by Grandfather Fire: Action in Quest of Truth. Eagle flies into the World of Manifest being, setting out the Path that is to be followed. Hummingbird, who communicates the gathered Wisdom of the Ages, insures that each member of the Circle is informed of the whereabouts and doings of each other Elder, then weaves the spell that will engage the Mind of each person who has sent their Dream to the Elders, that they may Dream the Dream as well. The mighty Red Stallion, now that he has been given the Divine Path to trod, gallops forth, carries the Celestial Soul of each of the People into the highest realms of the truth of each. Shape-Shifter, swift and without discernible reason, sends a storm of thunder and lightning into the Earth-Soul lives of the People gathered, causing them to stop, run beneath known trees for shelter, only to have the trees shattered by lightning, leaving the People uncovered, unsheltered, naked to the elements. Just as suddenly Shape-Shifter becomes an Owl that guides them into a cave. The People huddle in the cave, shivering from wet. As they warm, and feel the sense of protective safety again, here within the cave, they begin to explore. White Stag appears before them, dripping blood from his wound. As the People come closer he bolts, runs deeper into the cave, down a passageway, narrow but well floored, that tilts down into the ground. The tunnel is lit with a suffused glow that emanates from White Stag. Down, down, ever downwards the White Stag runs, the People following after, for now they are far from the mouth of the cave and fear to return without any torch to light their way. The wound of the Stag is the wound of the people. Each droplet of blood the sufferings they have undergone. Each drop of blood shed by the White Stag is the return of the wounds of the people to themselves. With each drop of blood shed, White Stag grows brighter still, and with that brightness each of the People now have their own Shadow. White Stag has run himself till he can run no more. He halts at the edge of a precipice. He looks back to the People who have followed him; he looks across the chasm to the ledge of rock on the other side. Beyond that ledge a forest, and meadows filled with flowers, is visible, but beset in twilight. White Stag collapses in exhaustion. As the People rush up to him, embroiled in the hurts and rage and resentments of each their own sufferings, and having come to believe that the White Stag is the source of these pains, they are overcome with the lust to overtake and kill him. As they close in around the White Stag, edged up to the precipice, they hear a howling from the darkness that freezes them with its cold, shrill intensity. Into the cavern-lit glow emanating from White Stag slinks Black Wolf. His tongue is a ‘loll, the red of his eyes a deep-lit fire. He prowls around the huddled gathering of the people who cower in fear. With each pass Black Wolf comes closer and closer to the People. Owl once again appears, fluttering his wings about the face of Black Wolf. As Black Wolf snips at Owl, Owl lifts, dives, maneuvers himself away from the sharp teeth and powerful jaws of Black Wolf. Owl flies to the side of White Stag. In the brilliance of White Stag’s light, Owl casts a Shadow that fills the cavern with darkness. Black Wolf emits an ear-splitting howl of the hunt and lunges towards Owl. Owl, in the same instant, flies towards the Black Wolf, his Shadow diminishing in size by so doing. In mid-leap Black Wolf’s jaws snap close upon, not Owl’s body, but about his Shadow, severing Shadow from body. Owl flaps his wings, gaining elevation, then soars across the chasm and alights in the branches of a grand tree on the other side. Meanwhile Black Wolf howls again with the success of the hunt, after which he gulps down the Shadow he has caught. The People have seen, and now know. It is not they, themselves, that Black Wolf is there to hunt, but their Shadows, their pains and sufferings that lay within their memories, the memories that cling to them as if they had a life of their own. Following the example of Owl each of the People relinquish their Shadow to Black Wolf, who shrilly howls in acceptance of their surrender and release. Into the snapping jaws of Black Wolf are fed the pain held within memories of abuse, betrayal, guilt and shame, the sadness of love unfulfilled and opportunities for kindness passed by out of fear. With the relinquishment of their Shadows the People begin to glow with the same light as the White Stag. Renewed, White Stag stands, collects himself to the edge and, with a powerful lunge, leaps across the chasm. An arc of rainbow light trails behind him. The gathering of the People follow, running across the rainbow bridge that arcs across the chasm, emerging on the far side amongst the flowers of the meadow, the trees of the forest. Their presence brings light to the twilight that had enfolded the terrain previously. A great wind rushes across the land as the Whoosh! of Eagle’s wings bring him above the scene. Guided by Eagle’s flight comes Red Stallion, in full gallop, Beautiful Maiden astraddle upon his back, her long tresses streaming out behind her. As Red Stallion comes to a halt, pawing and prancing, Beautiful Maiden slips down from his back and walks to the gathered People. She presents her hands, arms outstretched, palms facing up, in a gesture of welcome. Each in their turn takes her hands in their own. She ushers them down a trail that curves around the side of a large red spire of rock. The trail leads directly to a small cave, a den. In the den awaits the She-Lion. As each of the people enters the den they are cuddled to the teat of the She-Lion. Once fed, they sleep. And in their sleep they Dream, and in their Dream they are each joyous, healthy and fulfilled. The Old Shaman sits up, leaning slightly away from the Great Tree. The night is still, the People asleep, Dreaming. He gathers his ceremonials and walks back to his lodge in which he has lived for many, many years. He has returned home. Contact me from this link: Request the Shaman of Light Dreaming. State your Dream to be Dreamed (example: Good health. Abundance. Confidence) 3 requests maximum. Following the Dreaming of the World I will email you the Dream as it has transpired. The essence of your request will be woven within the greater Dream that I have written out.